BT.601 brought together a digital video standard for 525 (NTSC) and 625 (PAL) line systems. 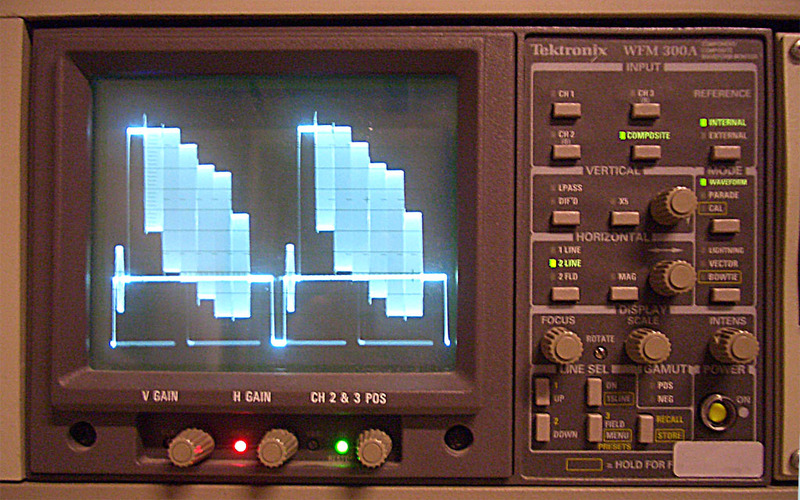 In NTSC 16 = 7.5 IRE (aka video setup in analog video marked with a dashed line in an NTSC analog waveform monitor) and in PAL 16 = 0 IRE (video setup for PAL) based on their respective standards. Hardware and software systems will have preferences that allow you to identify the recording standard you are using in order to manage the signal properly, including the display of the scopes. In the example you show, you are showing a Final Cut Pro NTSC session, where 16 is mapped to 7.5 IRE and everything below 16 is not part of the video signal. If you were in a PAL session it would map 16 to 0 IRE. Under any circumstance though, any digital video will place black at 16. 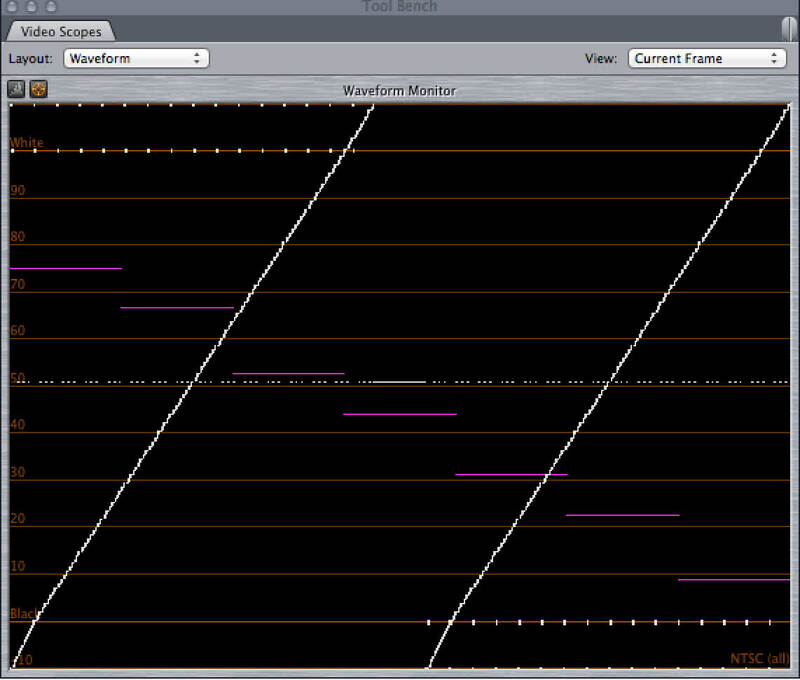 Therefore the source sample you made represents a video signal that wouldn’t exist under any normal circumstance. In fact it may even throw off the signal management performed by video systems. For instance, when outputting a digital video signal to an analog NTSC output, 16 would be mapped to 7.5 IRE. Or in 8-bit YUV to RGB conversions 16 – 235 is mapped to 0 – 255. I’m not sure how the signal you generated would be handled in either of these cases. It may just cut off everything below 16 and act as it always does, or it may cause some issues. Anyway, your point and demonstration is still a good and valuable one, but it’s worth noting the appropriate history and context here and going back to video fundamentals to properly interpret things. There is a good reason that the things you have found are the way they are. However, this doesn’t take away from your main message here, which I interpret to be “as caretakers of video signals we want tools that show us EVERYTHING that’s going on and these tools are often not found in the traditional video toolbox”. I wanted a leave a note here and say that when the file was tested on my own system, the native file specs are actually PAL (25fps), at a 352×256 raster. 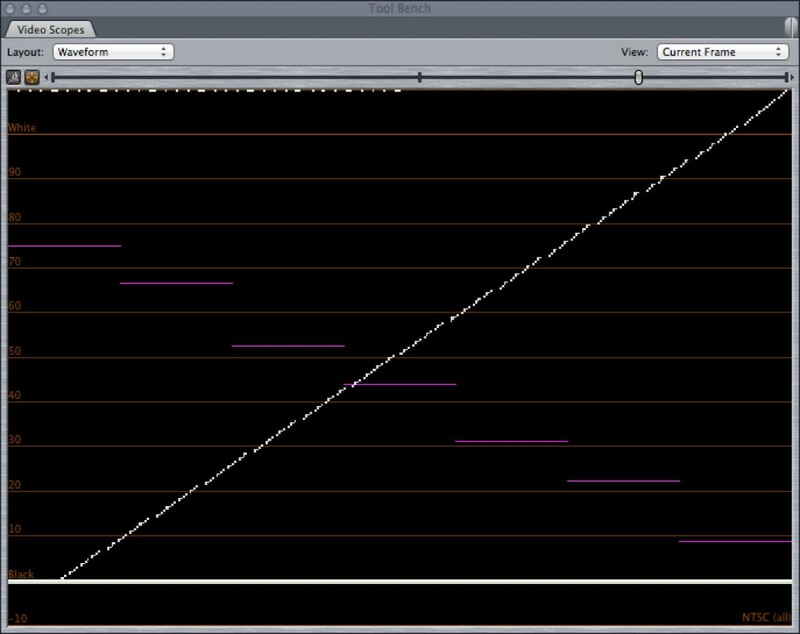 When forcing this file into either a PAL or NTSC timeline in Final Cut 7, the resulting waveforms are quite different from Dave’s screen grab – specifically, the grey ramp-like incline gets wider, and the black and white transients are rendered much more visible. The file viewed as an NTSC waveform in Final Cut clips everything below 16, as Chris has already mentioned. Based on the replies, I made two new samples. This time they are made directly to 720×486 at 30000/1001 fps (NTSC) and 720×576 at 25 fps (PAL). Each sample contains all 256 possible Y values at least twice that are separated by stripes at every 4 and 16 Y values. The separators at every 16 shades contain the equivalents of 0, 7.5, 100, and 110 IRE. The separators at every 4 shades as well the 48 columns in the middle are at the middle Y value, 0x80. The image is in uyvy422 but contains only 0x80 for U and V data. 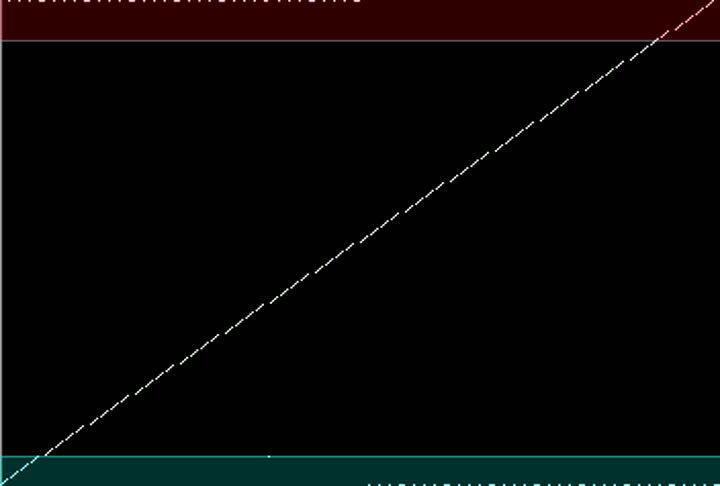 With these samples I was about to get the lower Y values to plot in Final Cut so that the 0-7.5 IRE range is plotted, as seen in this screengrab. Although the Y values increment at a steady rate, for some reason the Final Cut waveform plots the 0-7.5 IRE values at the bottom at a steeper slope than the 7.5-110 range. Final Cut waveform showing a sample file that contains vertical stripes of all 256 values for Y. However if I then re-size the waveform window, the waveform is redrawn at the new size, but the lower Y values are all crushed to 7.5 IRE. Final Cut waveform display is resize and the redrawn waveform cuts off 0-7.5 IRE. When advancing to a new frame the 0-7.5 IRE range is redrawn, so I think the issue with my first sample is that it was not already scaled to NTSC or PAL frame sizes and that the internal re-scaling process clipped some of the extreme values.